Ticket includes entry to the charity auction, MCC (South African sparkling wine), canapé reception, and a 3-course dinner paired with South African wines. If you want to sit together as a group, please buy combo tickets. If your group is more than 6 persons, please buy single person tickets and send us an email to let us know. We'll arrange a bigger table for you. Barclays MoonTrekker is Hong Kong's leading night hiking/running event that delivers a fantastic experience and raises money for a good cause. The Nature Conservancy leads the world’s most ambitious efforts to protect nature around the globe, improving quality of life for people in Hong Kong and everywhere. 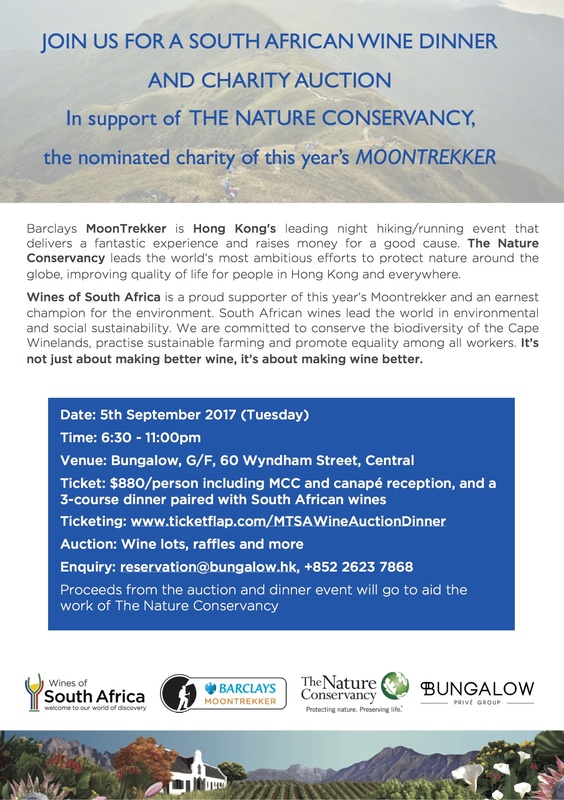 Wines of South Africa is a proud supporter of this year’s Moontrekker and an earnest champion for the environment. South African wines lead the world in environmental and social sustainability. We are committed to conserve the biodiversity of the Cape Winelands, practise sustainable farming and promote equality among all workers. It’s not just about making better wine, it’s about making wine better.